If you have some type of skin lesion, you may wonder how psoriasis look like. Most types of psoriasis have patches of reddened itchy skin but they often are similar in appearance to eczema and other skin conditions. To be sure of the diagnosis for psoriasis, a doctor needs to take a sample of the lesion and look at it under a microscope to determine whether it is psoriasis or some other kind of skin disease. About 90% of people with psoriasis have plaque psoriasis, which makes it the most common type. Commonly, it is slivery scales that cover red patches on the skin, but it also can appear as round or oval sores that expand into patches and appear on the elbows, knees or body torso. 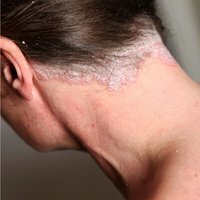 The answer how psoriasis look like when it is scalp psoriasis, or as it sometimes called seborrheic psoriasis, is the presence silvery or white scales close to the hair line. Scalp psoriasis looks like seborrheic dermatitis, which is commonly called dandruff or cradle cap in babies. The second most common psoriasis Guttate or raindrop psoriasis has sores that look like beads of water that appear on the arms, legs and trunk of the body. Outbreaks of the sores often occur with upper respiratory infections, colds, step throat and tonsillitis. Reaction to sunburn or poorly controlled psoriasis outbreaks is believed to cause this wide spread reddening and scaling of the skin. The lesions can cause cracks or fissures in the folds, which bleed and are painful. 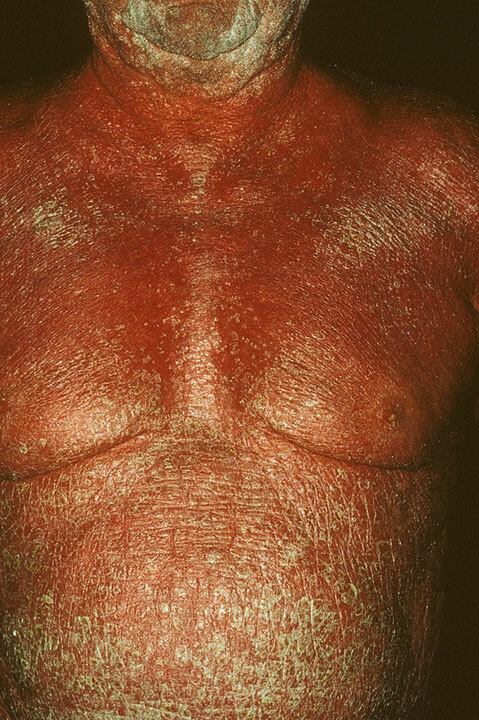 The location of this type of psoriasis demands careful diagnosis, as the lesions look similar to the chafing from rubbing and sweating, or yeast and fungus infections. This type of psoriasis has the typical inflamed, scaly lesions but causes the swollen, painful joints commonly seen in other forms of arthritis. It can lead to progressive joint damage and lead to permanent deformity of the joint. Von Zumbusch generalized pustular psoriasis fortunately is a rare form of the disease as it is life threatening. 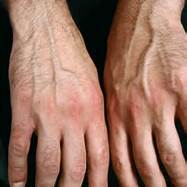 It causes fever, and a toxic condition within the tissues. It looks like layers of white-yellow blisters over reddened skin. Impetigo herpetiformis occurs during pregnancy with pustules, fever and increase in the white blood cell count. Some health care professionals believe it to be a form of generalized pustular psoriasis while others maintain it is a separate disease. It appears with a sudden eruption of the pimples on the scalp, elbows, palms of the hands and soles of the feet. Annular generalized pustular psoriasis is ring shaped lesions surrounded by pustules. Acrodermatitis continua of Hallopeau, a rare form of psoriasis, affects toes, fingers and the nails. When the nail is affected, the nail is lost and pus filled pimples form on the fingers and toes. 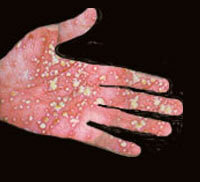 Palmoplantar pustulosis causes yellow-brown spots on the inflamed hands and feet. The simple answer to how psoriasis look like is red lesions often with silvery scales, and in rare cases, it looks like pimples on reddened skin. The kinds of psoriasis however depend where the outbreaks occur as well as the types of lesions. Psoriasis cannot be cured but it can be managed so if you have skin lesions, you should go to a doctor for an accurate diagnosis so that treatment can occur early and hopefully be effective.